The Colorado Midland Railway operated between 1883 to 1918. It ran from Colorado Springs to Leadville to Hagerman Pass to Aspen and Grand Junction and west of Glenwood Springs to New Castle. 1st std gauge RR over the Continental Divide in Colorado. 6 inch x 6 inch square Colorado Midland Railroad tin sign promoting its crossing of the Colorado Rockies. 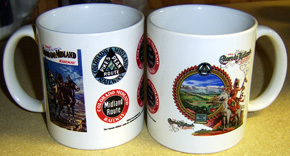 Beautiful Colorado Midland mug featuring the 7 Castles Pass, with a Ute Indian Chief. 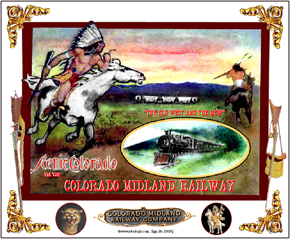 Back side contains image of an old time table cover and logos used by the Colorado Midland. 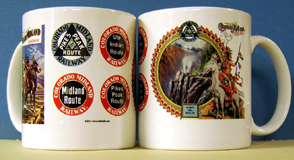 Beautiful Colorado Midland mug featuring famous Hagerman Pass, with a Ute Indian Chief. 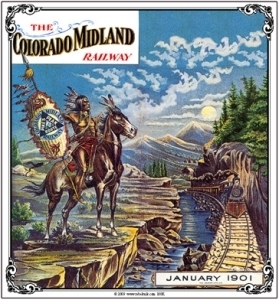 Back side contains image of an old time table cover and logos used by the Colorado Midland. Beautiful Colorado Midland mug featuring Hell Gate Pass, with a Ute Indian Chief. 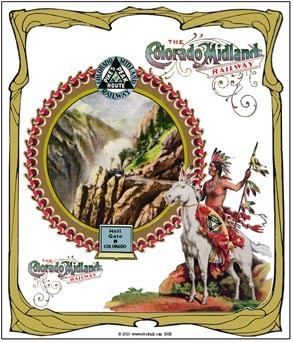 Back side contains image of an old time table cover and logos used by the Colorado Midland. 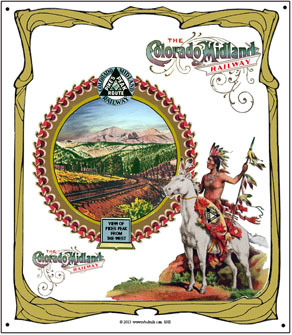 Beautiful Colorado Mountain Lion poster used by the Colorado Midland Railway. Features a Ute Indian Chief in a lower corner. Reverse side contains four logos used by the CMRR. 6 inch x 6 inch square tin UTE Indian logo sign of the Colorado Midland Railway. 6 inch x 6 inch square tin sign of the Colorado Midland Railroads 1890 logo featuring the Great Seal of the State of Colorado. 6 inch x 6 inch square tin sign of the 7 Castles Pass image used by the Colorado Midland Railroad. 6 inch x 6 inch square tin sign of Hagermans Pass on the Colorado Midland Railroad. 6 inch x 6 inch square tin sign of Hells Gate on the Colorado Midland Railroad. 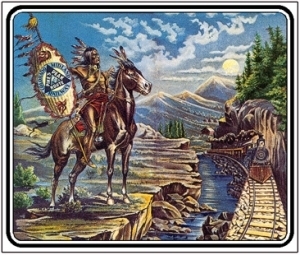 Image taken from old post card issued by the Colorado Midland back in the day. 6 inch x 6 inch square tin logo sign of the Colorado Midland Railway. This was the standard corporate logo used for many years. 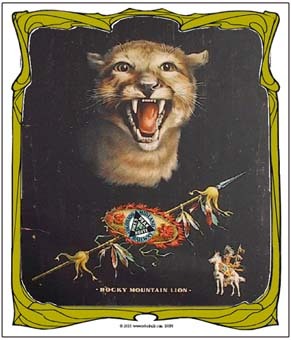 6 inch x 6 inch square tin sign of the Mountain Lion used in its advertisements in the late 1800s and early 1900s. 6 inch x 6 inch square tin sign of the Colorado Midland Railroads view of Pikes Peak as seen from the west looking east. 6 inch x 6 inch square Colorado Midland Railroad tin sign with its Midland Route logo. Colorful pad with a timeless western scene along the Colorado Midland Railway circa 1900 through 7 Castles, Colorado. Colorful pad with a timeless western scene along the Colorado Midland Railway circa 1900 on Hagerman Pass, Colorado. Colorful pad with a timeless western scene along the Colorado Midland Railway circa 1900 on Hell Gate Pass. 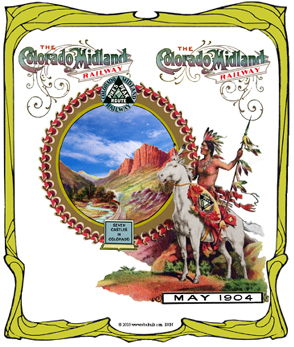 Colorful pad with a time table cover used by the Colorado Midland Railway in 1901. Ute Indian Chief with the Colorado Midland logo on his shield watches over his territory at Seven Castles, Colorado. A beautiful setting on the Colorado Midland Railway, first Rocky Mountain railroad to be built in standard gauge. 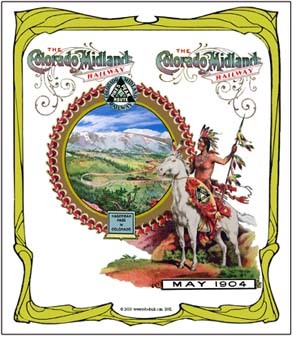 Colorado Midland Railway advertisement featuring a system map. 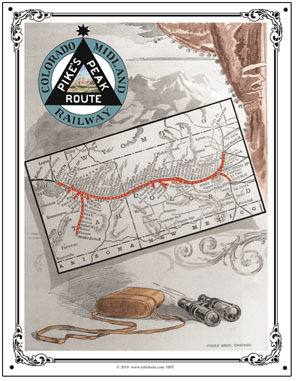 The first standard gauge rail line built across the Continental Divide in Colorado. A unique sign from a long ago railroad. 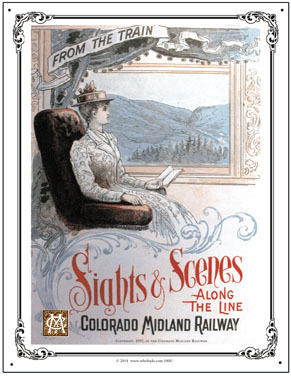 Colorado Midland Railway advertisement featuring a young Lady enjoying her scenic ride through Colorado. The first standard gauge rail line built across the Continental Divide in Colorado. 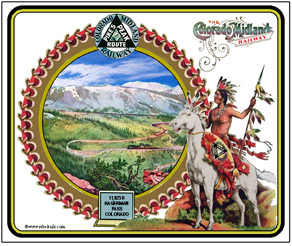 Ute Indian Chief with the Colorado Midland logo on his shield watches over his territory at Collegate in Buena Vista, Colorado. Note early Co Mid Rwy logo in lower right. 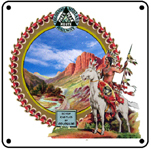 Ute Indian Chief with the Colorado Midland logo on his shield watches over his territory at Hagerman Pass. Named after James Hagerman, builder of the Co Midland Rwy. It lies between Leadville and Aspen, and is 11,925 ft above sea level. Hell Gate Colorado lies 10,400 ft above sea level on the Colorado Midland Railway. 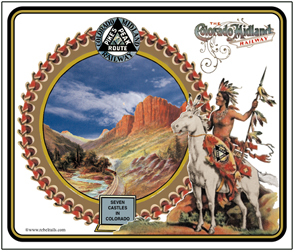 A Ute Indian Chief with the Colorado Midland logo on his shield watches over his territory sitting on a gleaming white horse. 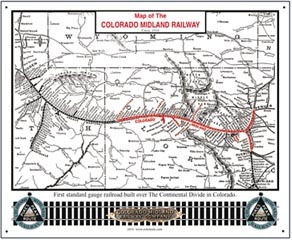 Colorado Midland Railway map circa 1918. The first standard gauge rail line built across the Continental Divide in Colorado. A unique map of a long gone railway. Ute Indian Chief with the Colorado Midland logo on his shield watches over his territory below Pikes Peak Colorado looking east. A beautiful setting on the Colorado Midland Railway, first Rocky Mountain railroad to be built in standard gauge. 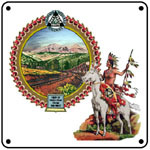 Tin sign featuring the Colorado Midland Railways Rocky Mountain Lion image along with spears, shield of Ute Indians and a Ute Indian Chief on horseback. This is a very rare image used by the Colorado Midland Railroad. Enhanced old Colorado Midland Railway advertisement featuring Ute Indians raiding a wagon train in a scene along the Colorado Midland Railway in its early days. Ad promoting Scenic Colorado in the old and new west.....! 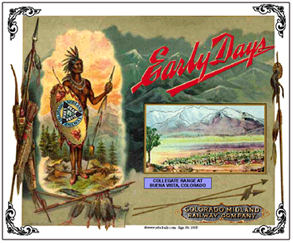 Tin sign featuring one of the Colorado Midland Railways time table covers. 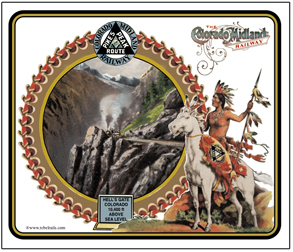 A Ute Indian Chief with the CMR logo on his shield watches as a turn of the Century steam locomotive rolling along the roaring river passes by.